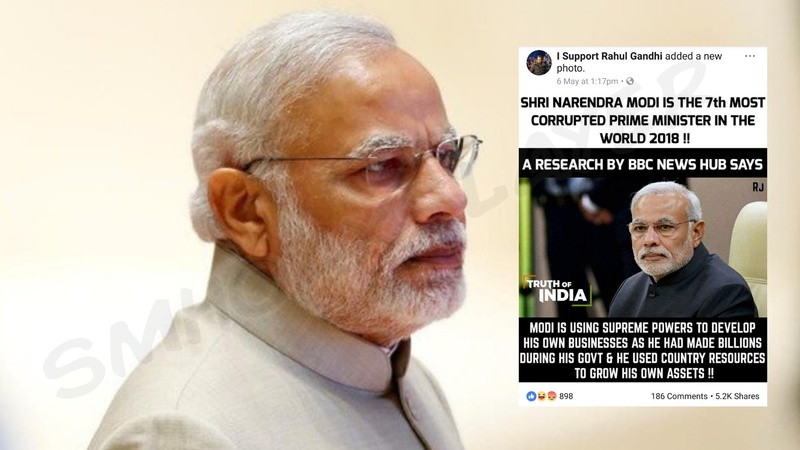 A supposedly ‘news’ article posted by bbcnewshub shared by many claims that Indian PM, Narendra Modi is 7th most corrupt Prime Minister in the world. A Page by Rahul Gandhi Supporters “I Support Rahul Gandhi” with approx 90000 followers posted an image saying the same and by now has 5443 shares also. #Feku Chai waala Modi is 7th Most corrupt politician in the world (via BBC). Modi named as the 7th most corrupt head of a nation by BBC. Why BJP is not protesting ??? Indian PM Narendra Modi is on 7th Position in Top 10 Most Corrupt Politicians in the World 2017. HOW CAN SC EXPECT PM MODI THE 7TH MOST CORRUPT PERSON IN THE WORLD OUT OF 10, TO EVER APPOINT A LOKPAL? This article is fake, it’s not the genuine BBC media house but a small time website. So while the “I Support Rahul Gandhi” says “A research by BBC News Hub”, The bbcnewshub itself only says “Narendra Modi is known as most corrupt” i.e is known as without any proof, source etc. Further, while people fell for the acronym bbc, bbcnewshub has nothing to do with the real BBC media house. 3. The disclaimer on the site itself says they not 100% sure. “But as mentioned it’s not 100% sure by authority of this site that information accurate, complete, Reliable, right along with images, photos, information, knowledge and other any type of material which are available on our website due to internet. Which is the 4th Most corrupt party in the world ? Congress or BJP ?